Ever have a hard drive go bad? Had many photographs or something where a corrupted memory card or disk is just not the answer you wanted to hear? Hey, you might be in luck. PhotoRec to the rescue! 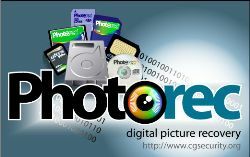 PhotoRec is open source, and can be used with your major operating systems (DOS, Windows, linux, Solaris, MacOSX, BSD), and basically looks at corrupted file systems and copies over whatever is there onto a working system. It’s best for its namesake, but it recovers many other things by looking at the mediums’ filesystem. But why take my word for it? Just take a look at Kent Brewster’s story.